In addition to ongoing construction work on large projects, Virginia's transportation innovation head is recommending $30 million in high-tech projects on I-95 roughly from the Capital Beltway to Kings Dominion. WASHINGTON — Changes meant to help ease traffic jams along more than 60 miles of Interstate 95 could include variable speed limit signs similar to the ones many drivers ignored on I-66, as well as a number of other technological upgrades. In addition to ongoing construction work on large projects, Virginia’s transportation innovation head Cathy McGhee is recommending $30 million for high-tech projects — including traffic lights at on ramps and better information for drivers — on I-95, roughly from the Capital Beltway to Kings Dominion. The changes would address both weekday rush hour backups and regular weekend delays. “We have a combination of projects to address these very different kinds of congestion. To deal with the commuter congestion, we’re looking at ramp metering,” McGhee said. That part of the project would put traffic lights at the end of three northbound and four southbound on ramps to permit only one car to accelerate toward the main lanes at a time. “If we release them from the ramp one at a time, it creates a smoother transition at the merge point,” McGhee said. On weekends, if drivers pay attention to overhead signs, she said recommended speed limits like the ones the state had above part of I-66 for a few years could help. “What we believe might be very effective on I-95 based on current conditions is the variable speed limit/speed harmonization. In the interest of full disclosure, I will say that it wasn’t particularly effective on I-66 as it was deployed there primarily because people paid no attention to the speeds that we posted,” McGhee said. On I-95, the state could send letters or otherwise try to contact drivers who ignore the overhead signs warning of slowdowns or crowding ahead that recommend slower speeds. In Europe, the signs have been more effective in a number of places because drivers actually pay attention to them. “This project would look specifically at how we can make it more effective within the I-95 corridor and will likely include some significant data collection on compliance along with an education component that would target specific drivers who are not complying,” McGhee said. The main traffic speed increases on I-66 with the system were tied to the opening of the “red X lane” outside of rush-hour periods. The state is also looking into “virtual” active traffic management with recommended speeds communicated through apps or through vehicles themselves that now have the ability to connect and communicate with roadway infrastructure. A separate project — that could be funded through the same innovation dollars — would track available parking spaces at commuter lots along I-95 in the Fredericksburg area, as part of efforts to encourage carpooling or transit use to reduce traffic jams. At the northern end of the corridor, the state is focused on another project. Data analytics and predictive technologies could work together to provide incentives to drivers who choose a different route and to help position crash response vehicles in the locations most likely to see a problem. Overall, the Commonwealth Transportation Board is expected to consider 13 of these innovation projects during June vote on the state’s six-year construction plan. “Some of these may not work, and that’s okay, but … if it works, we’re going to take those lessons and deploy them statewide,” Deputy Transportation Secretary Nick Donohue said. 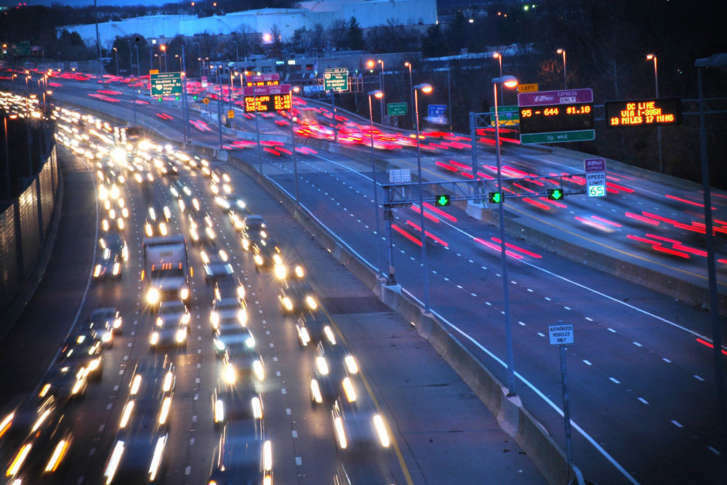 The I-95 technology projects would be folded into an Virginia Department of Transportation I-95 corridor improvement plan, expected to start developing later this year. “If there are cheaper ways to solve that, we want to try and do that,” Donohue said.